Mushrooms on toast. Mushrooms on toast. Mushrooms on toast! 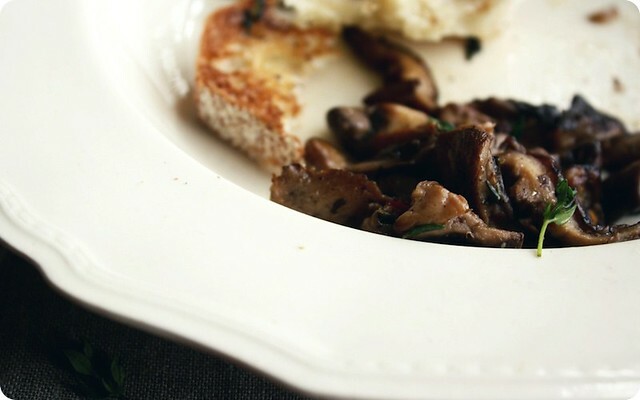 Or, as pictured, mushrooms and toast. So that didn't work. Nothing I do, no matter how I say it, can make mushrooms on toast sound as though they are all that exciting. But boy, am I excited about them. In fact, they've been all I want to eat these days. And so, after a too long absence that has me eager to bring you trays of chocolates and sweets, of cakes miles high and swathed in seven-minute frosting, in my way of saying I'm glad to see you, I'm here instead with a plate full of everydayness. But robust everdayness - toasted bread and a tumble of mushrooms, with their tawny edges tanned and glistening. Though simple, they are far from plain and even farther from boring. 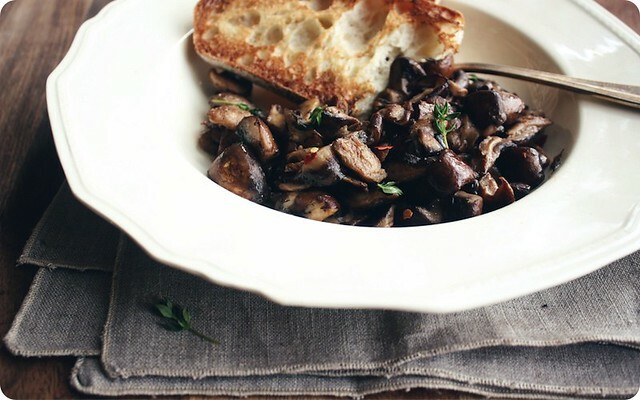 From Jamie at Home, by Jamie Oliver, the mushrooms are meaty, substantial and all-around good stuff. I made them the first time to share for a November lunch. The next day, I had them again for a solitary late-morning breakfast, free in my singularity to shamelessly drag my toast across the skillet in which the mushrooms had cooked, lest I miss an ounce of their liquor that was left behind. That first time we ate them as is, piled on slices of grilled bread, and for the second time I perched a poached egg just so. Another time there were irregular chunks of creamy buffalo mozzarella cozied up on the plate. Never you mind all of that though, to begin I think it best to go with this dish in its purest - straight up, nothing to get in the way of what we have going on here. What that exactly is, is mushrooms with attitude. The first succulent bite had me sit up straighter and pull my chair an inch closer to the table. Where I think the draw lies in this dish is in how the the mushrooms are cooked - everything's added in stages to gain the greatest advantage of their qualities. Into a pour of olive oil alone goes the mushrooms, then the garlic, chili and thyme. As they cook, their moisture is released, the aromatics open up and perfume the steam as it puffs from the pan. The liquid condenses soon enough and then it's time to feed in a knob or two of butter, which glosses all, adding richness and roundness. A few drops of lemon, then the transformative ingredient - water - to end. Yes, water. It's the lynchpin to this whole business of mushrooms on toast, I'm telling you. That splash of water bubbles up, picking up all the stickiness around the skillet and turning into a surprisingly creamy, absolutely rich gravy. You'll fight for your share. Pick a craggy bread with enough bumps and pockets to catch that sauce and collect it into luscious pools. That's the best way to go. Since we're chums and catching up, I'll mention that today's toast, the one I'm crummy with right now, is with aged cheddar and chili pepper jam. That one we'll save for another chat. For now, get on those mushrooms. From the book Jamie at Home (Hyperion, 2008).